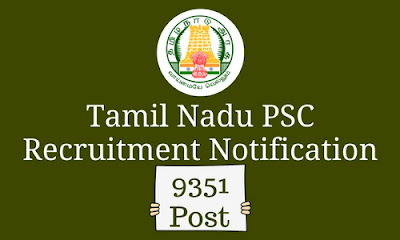 Tamil Nadu Public Service Commission has released a direct recruitment notification for 9351 vacancies. Last date for payment of Fee: 15-December-2017. Candidates must have passed minimum general educational qualification wise and must have passed S.S.L.C Public Examination or its equivalent with eligibility for admission to Higher Secondary Courses of Studies (or) to College Courses of studies.